“The world was never more ripe with wonder and magic and possibilities than when we were teenagers. It was also likely that we never felt more awkward, self-conscious and out-of-place. That step up from being a kid, when we first peer through the confusing, swirling mist of adolescence and catch just a glimpse of the secret world that lies beyond – that’s what leaves its mark on all of us, and it’s nice to occasionally escape the grown-up world and go back there. I go back there in books. The stories with those universal coming-of-age themes help to remind us of things we had long stashed away in the repository of our minds; their telling helps us retouch on wondrous times that once stirred our spirits. Growing up is never a straight road; it’s a meandering river that drags you beyond your depth, sometimes through slow lethargic reaches, sometimes over churning rapids – but in hindsight, it’s the uncertainty of the journey that makes it so special. I had so much fun writing Spinning for Jacks because it allowed me to go back there, to let that river take me. Sure, this time it is a fictional river – but if all fiction has its roots in the memories of life, then Spinning for Jacks is no different. In Spinning for Jacks, Jamie Croydon’s coming-of-age evolves out of the wide-eyed wonder, awkwardness and humour that is the universal backdrop of teenage life. However, it is Jamie’s unfolding awareness as he searches for truth that defines his journey. That search reveals forces more powerful than the authority of principals and parents, some dark forces that threaten his very grip on reality and other powers that make him gasp with wonder at their touch. Dan Willett lives on Queensland’s Sunshine Coast with his wife and two daughters. He has worked for more than 20 years as a Fisheries Scientist, which has taken him off-shore and to rivers throughout Queensland and beyond. 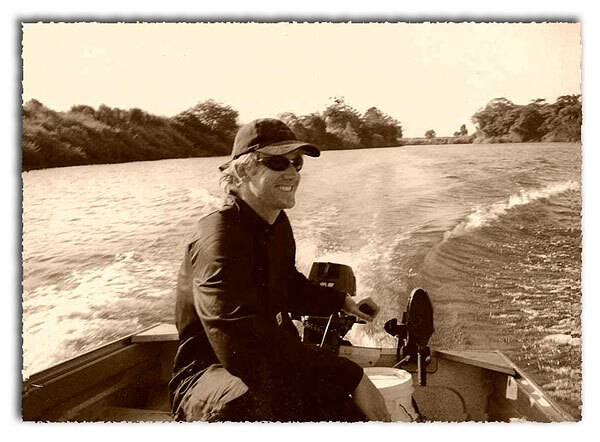 Dan holds an M.Sc in aquatic biology, and has published widely through various scientific and industry media. Spinning for Jacks is his first novel, but carries that same watery theme that has fascinated him since he was boy.